LIVE LOVE LAUGH WALL DECOR home decor, jewelry, decor, decorations, electronics, fountains, floor mats, art glass, vases, garden essentials, fireplace screens. 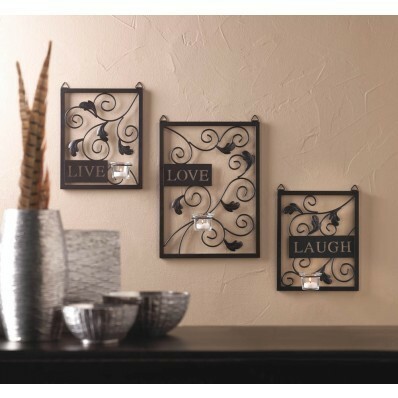 Remind yourself whats important everyday with this splendid set of three candleholder wall plaques. Made from dark metal, each piece carries a clear glass candle cup and a wise word, "Live, Love, Laugh." Candles not included. Weight 5.44. Dimensions 11" x 3" x 15"